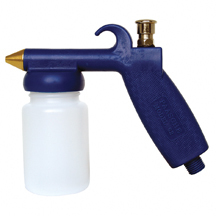 Compact size glaze sprayer which uses the same 3 oz. bottle as an airbrush. Operating on relatively low pressure, the 62-2 has a 50% larger tip than the 62-1 and efficiently sprays thinned glazes, medium to heavy consistency lacquers, varnishes and enamels. It handles the application needs which fall between an airbrush and a spray gun. Used by ceramists, furniture refinishers. Operates on 20 - 45 lbs. of pressure (can be used with Model D compressor), depending on fluid sprayed and effect desired. Comes complete with 1 - 3 oz. bottle.